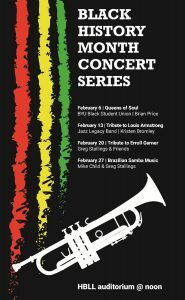 To celebrate Black History Month, the Harold B. Lee Library put on a concert series every Wednesday at noon. PROVO, Utah (February 2019) Black History Month started with an idea: in 1969, educators at Kent State University proposed dedicating a month to celebrating Black history, including accomplishments, recognition, and inspiring stories. The next year, Kent State was finally able to live their idea and from there, educational institutions and rural communities followed suit in rapid succession. By the end of 1976, the celebration had spread throughout the entire county. Today, much of the western world has a month to celebrate Black history. BYU proves no exception. Here at BYU, we had a host of events including a Black History Month Concert Series held in the auditorium of the Harold B. Lee Library (HBLL). Every Wednesday in February, a bunch of music lovers got together and enjoyed some live jazz. Students were dazzled with the performances and vocals from the Black Student Union in the first week of this concert series. The Union performed a myriad of music from “Chain of Fools” and “Think” by Aretha Franklin to “A Sunday Kind of Love” by Etta James. The club appropriately titled their performance Queens of Soul. The next week of the Black History Month concert series, BYU’s Jazz Legacy Band gave the audience a Tribute to Louis Armstrong. The week before, the Jazz Legacy Band had participated in and were recognized at a jazz festival in California where they had performed many of the songs they stole the audiences hearts with on the 13th, including the classic “Bourbon Street Parade” by Paul Barbarin; “When You’re Smiling” by Larry Shay, Joe Goodwin, and Mark Fisher; and the “St. Louis Blues” by W. C. Handy. The third week of the concert series was a Tribute to Erroll Garner, where students enjoyed poems that were read between each song. Erroll Garner is known for enriching his music with Latin rhythms, for this reason, Spanish and Portuguese poems were shared between numbers like “Misty” by Erroll Garner and Johnny Burke, and a medley of “They Can’t Take That Away” by George and Ira Gershwin, “How Could You Do a Thing Like That to Me?” by Allen Roberts and Tyree Glenn, “Where or When” by Lorenz Hart and Richard Rogers, and “Erroll’s Theme” by Erroll Garner. The final week’s performance changed beats a little bit with Brazilian Samba Music. The history of slavery in Brazil is rich and unforgiving. Of the western world, Brazil was the last abolish slavery as late as 1888. It is estimated that of all of the slaves that were in the Americas, 40% of them were in Brazil. Including Brazilian culture into the celebration of Black history was a wise choice. This last week of the celebration had the largest audience and tapping feet and nodding heads could be seen across the room as the room listened to a variety of Brazilian Samba. This celebration began with “Foi um Rio Que Passou em Minha Vida” by Paulinho do Viola, continued with “Mas Que Nada” by Jorge Ben and some others, then ended with “Canta, Canta Minha Gente” by Martinho da Villa. This concluded the Black History Month Concert Series celebrations and left the audience with the reminder of everything we’ve gained since the abolition of slavery.